Monday: Mary Connealy talked about (maybe whined about) marketing. The winner of an ebook copy of Loving the Texas Lawman is Heidi Robbins, and I'm giving a bonus copy to Pat Jeanne Davis--because I loved her comment. The winner of an ebook copy of Loving Her Texas Protector is Susan Akens and I'm giving a bonus copy to Wilani Wahl because she had a really hard week! Wednesday: Ruthy was here on Wednesday with a post on To Write... or Not to Write, chatting about procrastination and she found a few procrastinators in the crowd! :) But she also found winners, so winners of a two-fer of Ruthy books "An Unexpected Groom" and "Her Cowboy Reunion" are Kayla and Rose! Monday: Do you get inspired to write when you get out of your normal setting? Today, Missy Tippens will be sharing a virtual beach retreat!! You don't want to miss this mini-getaway. Bring your flip-flops and laptop and prepare to get inspired by the surf and sand. You can also enter her giveaway for a "Life is Beautiful" tote and a Kindle copy of His Summer Valentine! Wednesday: Publishers Weekly bestselling author Debby Giusti will be discussing something writing related and giving away books! Be sure to stop by and leave a comment. Friday: Winnie Griggs will be sharing some of her thoughts on Connected Stories - what they are, how to make the connections, how to know when you have the makings of a strong series, etc., along with tips and pointers. Join us for the Natchez Trace series by Pam Hillman Takeover Tour beginning August 13, 2018. Hosted by JustRead Publicity Tours, it will be filled with plenty of fun stops across social media and enter for a chance to win a great prize pack from Pam! 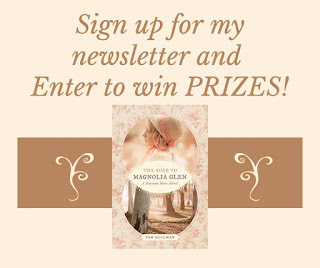 The Promise of Breeze Hill and The Road to Magnolia Glen are both available now! Ruthy is hosting a luncheon for the Hilton Readers' Guild on Wednesday, August 15 where she and a lovely group of ladies will talk books, farm life, and why we love fiction... While sipping lemonade and eating burgers prepared by some of the men at Blodgett Family Farm. 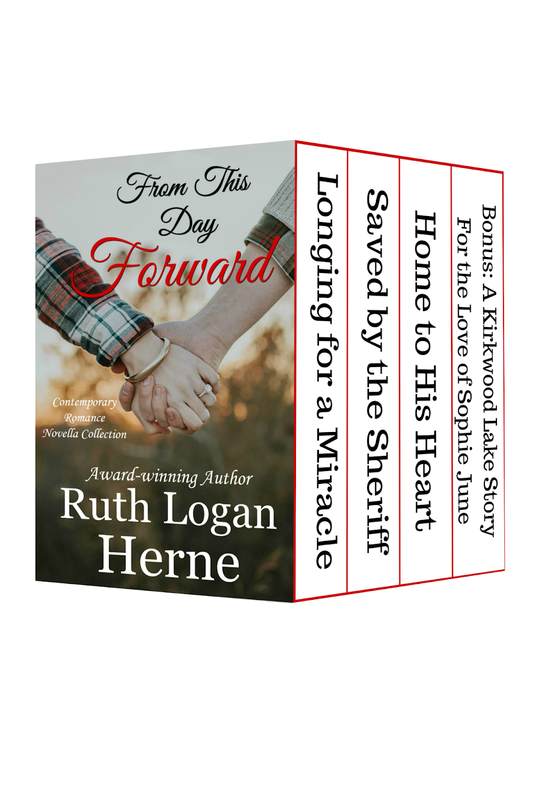 And don't miss "From This Day Forward", a lovely release of four beautiful Ruthy novellas! The three Karralis cousins novellas and a bonus Kirkwood Lake novella about a secret baby and a second chance that no one saw coming... Until it came. bookstores, online and at Walmart and K-Mart. Love Inspired: A Story for Every Reader. or Second Place gets all 10 Sweet Romance Reads! Book Launch Checklist: A Marketing Timeline for Traditionally Published Authors at the BookBub blog by guest Debbie Macomber. I hope you all have a great weekend! I'll see you on Monday for the mini, virtual beach retreat! This looks like a really good week. Missy and Debby always have something good to share, and I am particularly looking forward to Winnie's post on Friday. I seem to gravitate toward series, I always leave some unfinished business in my first stories and take care of it in sequels. For my Oregon Trail story, I couldn't help wondering what would happen to Michael's sister after she left the convent, and I wondered if there was a woman out there for Pace, my trail boss. There was a lot of unfinished business there, which I hope I dispatched with the sequel. May someday write a stand-alone, but in the meantime, "unfinished business" is a great spark for series. Good morning, and happy Saturday, everyone! Congratulations to the winners! Next week looks fabulous! What is everyone up to this fine Saturday? It's a writing day for me, while hubby takes care of some chores around the house. Saturday is one of my favorite writing days, Jan. Seems I have more time on Saturday. Go figure. Congratulations to the winners and Happy Saturday! Caryl, hope you're having a great one too! Thank you Mary for the book. Congrats to all the winners. I am having a slow morning. I dreamed last night and struggled to wake up but by the time I woke up. I had another story with even a title. Now to get caught up enough to write down the bare bones so I won't forget what I dreamed. What a marvelous burst of inspiration. And I agree... I jot down little post-it notes on my desktop of my laptop, just to remind me of the basic plotline and that gives me enough to develop the story when I'm ready to. My "desktop" is a mess of sticky notes, but who cares??? Good for you! I once had a semi-dream (I felt like I was falling asleep, so maybe it was just daydreaming) and had an idea for a book. I got out of bed and typed for an hour. That was years ago, and I never have finished that book. I must do so! It's a YA. I've been catching up on SM, some business and blanching peas and shredding squash to freeze. We have a lot of summer squash and the best way I've read to preserve some for winter is to shred and freeze it for bread and soups. Pam, do you have someone in your family who can't have gluten? Another overcast day in GA. Usually we have sunshine throughout the summer. Today makes me think of fall leaves and pumpkins! Debby, my daughter and I were commenting on that last week. It reminded us of fall weather! Happy weekend, everyone!!! Things are gearing up for seven weeks of crazy here on the farm... and I'm working to finish book 4 of the "Shepherd's Crossing" series... and trying to get a few things fixed/done/repaired before time slips away and autumn rains (which apparently are in Georgia, Debby Giusti!!!)arrive... pumpkins are growing, the first mums are almost ready to be brought up to the roadside, and we're baking fun things to eat and sell! In between it all, I realize how amazingly blessed we are. Not just me, but all of us. To have an amazing country, wonderful friends and families, and opportunities to do so much. Bless you all! Enjoy the rest of your weekend. You are beloved! Ruthy, we have had a really rainy summer! We are blessed, Ruthy! Such a wonderful country...our freedom...our faith that can be practiced without fear...which is not the case in far too many countries. Hope it has been a good weekend for everyone. It has been busy for me again. Celebrated my niece's birthday with family yesterday (she is 22 tomorrow). It was a fun day. Today I'm trying to catch up. Another busy week. I have two nephews and a niece heading off for college this week. Some family will be in Nebraska while heading to college, so will be doing some running around seeing family. After that I hope to have some time to stay home awhile. School starts this week and I already have a sub job on Friday. Sandy, I bet all the teachers want you to sub for them! Didn't I see that you and your husband celebrated an anniversary!!! Congrats! Loved your wedding picture! :) I know the day prior was tough. You are always in my prayers. Thank you, Debby. You are so sweet. I don't know that I am that much in demand, but I do keep busy. Yes, we just celebrated our 32nd anniversary. Thank you for the compliment on the picture. Sigh. We looked so young. And thank you for the prayers. The day of Laura's birthday is tough. We make it through together.